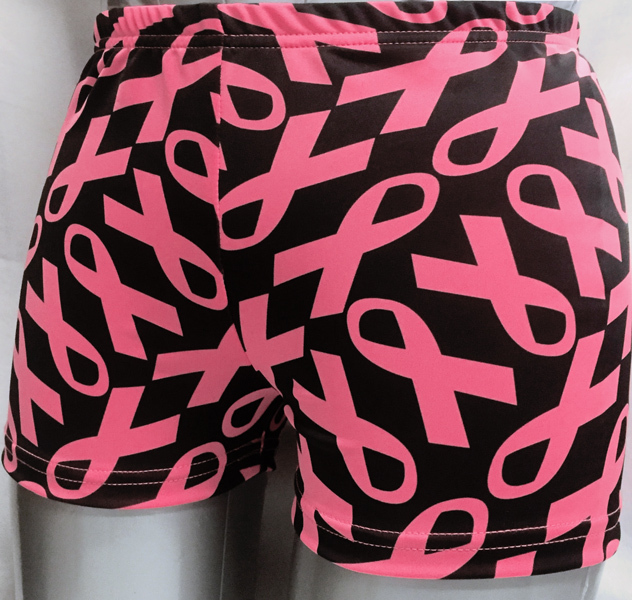 These Fun & Bright Pink Ribbon printed Women's Volleyball Spandex Shorts will Show Your Support for Breast Cancer Awareness & Research and will be great shorts to wear at camp, during practice, or just while working out. Svforza brand Pink Ribbon printed Spandex Compression Shorts are made with a 80% polyester / 20% lycra spandex blend fabric, and are as durable as they are comfortable! This fabric is used for Performance Activewear and offers a 4-way stretch, and Moisture Wicking to ensure maximum comfort and durability. Cancer Awareness Pink Ribbon Spanx Juniors Spandex Shorts also have a comfortable Elastic Waist. Made in the USA. Bright Pink Ribbon Spandex Shorts SIZING CHART: (Waist Inches / Ladies Sizes) - approx. Inseams: are approx. 2-1/2" to 3"
Breast Cancer Awareness Pink Ribbon printed Girls Spandex Compression Shorts Can Be Worn For Any Sport... Volleyball, Softball, Soccer, Cheer, Dance, Swimming, Basketball, Yoga, Cycling, Running, your Personal Workout, Walks For The Cure, and/or any other Fitness or Fun activity.